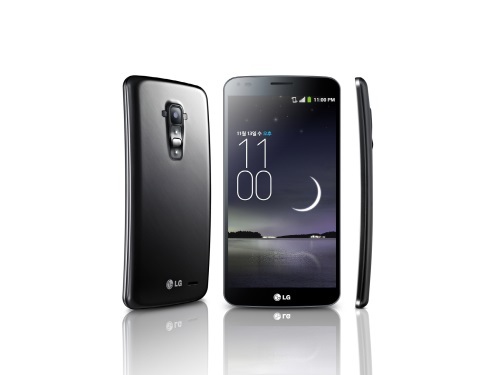 Over the weekend, LG introduced the G Flex, calling it the world’s first “real” curved smartphone. That’s a bold claim given that Samsung’s Galaxy Nexus display had a small curvature and Samsung recently announced the Galaxy Round, which clearly uses a curved display, albeit not in the way you’d expect. It doesn’t matter who was first, though; such claims are becoming more about companies yelling “FIRST!” and less about improved user experiences. Whoa: Calls will sound slightly louder and the phone conforms to my buttocks while also letting me imagine I’m in an IMAX movie theater enjoying an immersive video on a 6-inch screen! Excuse my cynicism if you will: Normally, I’m open-minded about trying new features and functions in mobile products. The race to create a curved phone is bit silly, though. If it adds value, I’m all for it. I’m just not sold on the concept when some of the new user interactions appear to be added simply because the device is curved. The G Flex, for example, has function that “alters the image on the lockscreen depending on how the G Flex is held.” It seems more like a way to showcase the fact that LG can create a curved display rather than a highly desired end-user feature. Samsung’s Roll Effect on the Galaxy Round is much the same: A way to view notifications by rocking the phone on its back: More gimmicky than revolutionary. LG says the G Flex launches in Korea next month and that availability in other countries will be announced later. I suspect very few additional markets will be announced because the G Flex sounds more like a science experience or concept device to prove that the company can compete in the race for curved display technology. Sadly, I don’t think many consumers will be lined up along the sidelines to see who wins. If you are cynical about the technology behind flexible OLEDs, perhaps you shouldn’t be a technology writer. Flexible OLEDs are fantastic. They will solve an epidemic of waste with shattered screens, whilst making phones cheaper and more vibrant. The complex glass sandwiches known as LCDs have come a long way, reaching their pinnacle with latest and greatest IPS Retina displays. However, this technology has reached its final chapter. The curvature of this particular phone isn’t that interesting but the screen itself is. I think this is built on flexible plastic substrate rather than glass. If that’s the case I will be particularly interested to see how the reviews come in about screen quality. Curved screens might be ‘meh’. But lighter and much less likely to break screens – now that is an advancement if they as good as traditional screens. Be a great back pocket phone for Kim Kardashian, other than that…….. meh.